The dark blue sky was aglow with a thousand shiny stars. “How pretty are the stars!” mused Mehnaz. She sat alone on the bench. No one was around, or at least, no one she could see. She took a cigarette out from her bag; it was the last one she had left. She searched for the lighter but couldn’t find it, so she kept rummaging through her bag until she finally concluded it wasn’t there. Infuriated, she threw the cigarette on the grass, returning to her musing. A little while later, she picked it up and put it back in her bag. She knew she would need it later on. Aisha hadn’t slept the whole night again. She kept thinking about her life; her messy, disorderly life. She thought about her husband, her children, and herself. The distance between them was growing. They were no longer the family they used to be. The magical world that Aisha had built around her perfect little family was dissolving. Aisha’s thoughts swivelled around the past day. When she told Shehryar to focus on studying instead of using his phone all the time, he turned red with rage. He shouted at her, and told her she was the worst mom ever. Mehnaz didn’t call her again. It had been a week. She probably didn’t realise how lonely her mother was. A lot of times she wished she hadn’t sent Mehnaz to another city for university. She missed having her around; her childish prattles and loud, silly laughs. With her husband, things weren’t much different either. Amjad called her last night and told her he was going to get late again at work. She didn’t believe him, but told him it was fine. She was used to not having her husband come home on time by now. Aisha nervously looked at the anti-depressants that sat on her bedside table untouched. She swallowed two tablets, and drifted into an uneasy slumber. 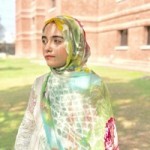 Mehnaz was wrapped up in a sea green sweater her mother had painstakingly made for her. This was her way of tapering off the distance and being close to her. It was almost painful to think about her mother. She missed her terribly. This was her third year away from home. During this time, she had indulged in things she knew would deeply upset her mother, if she were to find out. So far, Mehnaz’s secrets were hers alone. But for how long? She suffered a pang of conscience. She lit a cigarette, and sent the smoke spiralling into the chilly air. The world suddenly looked grey, like the puffs of smoke disgorging from her cigarette. Mehnaz was home after months. She wasn’t the same person anymore. Her laughter had died out into silence, and she looked weary. She was breaking, she was hurting, and she was drowning in gloom. It was heartbreaking for Aisha to see her daughter sinking below the unforgiving waves of guilt. Aisha wished that she could speak to her, help her, and make everything less painful for her. But she couldn’t. The thought that her children didn’t need her anymore held her back. She looked at the morning sky from her balcony; it was blue, empty and endless. It was oddly similar to her life. Messy, disorderly life. Many nights when sleep eluded her, Mehnaz sat under the star-strewn sky and looked up at the mantle of stars spread over the fathomless sky. This night too, she was plopped on the swing outside her house, looking at the stars in the sky. Her cheeks glistened with hot tears. She had cried after months. It wasn’t a home that she lived in, but a house – the home had broken down years ago. Her mother lived on anti-depressants, her brother hardly ever talked to her, and her father was never home. They all lived together, but they were suddenly very different people. They weren’t a family anymore. Mehnaz felt a wistful longing for the old days; happier days. There were no happy days in her life anymore, just days that were passing one at a time. Mehnaz lit a cigarette. Wreathes of smoke curled up into the cold night air.